I was quite surprised to read, a few weeks ago, that a new pedal for guitarists was about to be officially introduced: the Jimi Hendrix Experience. A perfectly legal enterprise, you see, with the benediction of the Hendrix family and the complete collaboration of legendary Hendrix tech Eddie Kramer. By using a proprietary technology, DigiTech's pedal can replicate (duplicate? emulate? I'm waiting for reports) sounds that were an integral part to seven songs made famous by Hendrix, such as Purple Haze, Little Wing, Voodoo Child and All Along The Watchtower. Having been a witness to many a fight between fans of the two guitarists, I have to confess that my second thought was: what, no Eric Clapton pedal? There is one, of course, named (surprise!) Crossroads. It obviously features the tones to classic Cream songs such as Sunshine Of Your Love, Crossroads and Badge (have no fear: Layla is featured, too). Among other things, the pedal is said to be able to duplicate Clapton's famous "woman tone". It was at this moment that I recalled the Eric Clapton interview featured in Cream Farewell Concert, the movie that presented Cream's last concert held on November 26, 1968, at London's Royal Albert Hall. 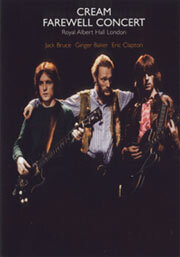 In the course of the interview (shot the previous year, like those with Ginger Baker and Jack Bruce that appear in the movie) Clapton is asked to show on his guitar (which is the famous SG/Les Paul he used for a big part of the group's career, not the ES-335 that he used for most of their final concert) some of his classic licks - and his famous "woman tone". Which he does. I wonder how many times he had brought the stylus back while listening to some B.B. King album (say, Live At The Regal) in order to find the secret to that mysterious tone. (Just like our friend who, having watched the movie in London, told us that "Clapton did it exactly like this".) Quite funny to imagine Eric Clapton that, when asked to show his "woman tone", whips out a B.B. King pedal and proceeds to dial the appropriate preset. Maybe this is the reason why the tiny excerpt of Cream performing Skip James's I'm So Glad from Farewell Concert featured in The Soul Of A Man - the movie about the blues directed by Wim Wenders - is such a vibrant, contemporary, and explosive moment, when compared to the clowns, poseurs and assorted buffoons that are featured in the movie. Quite difficult to play, the music that Cream performed for a couple of years all over the world (mainly in the States - their Fillmore concerts of '67 a turbo push towards change that is not mentioned very often) was made of many parts. Clapton's deep knowledge of the blues, obviously: the three King (Albert, B.B. and Freddie), Skip James, Robert Johnson, Hubert Sumlin, Howlin' Wolf, Willie Dixon, Otis Rush. A highly volatile (also on a personal level) rhythm section, Bruce and Baker had already played together in the Graham Bond Organization. Behind Baker one could easily see people like Sam Woodyard and Elvin Jones (and - provided one lived in London - Phil Seamen). Bruce's background was wide, from Mingus jazz to Bach counterpoints. All three breathed freely onstage, trying to earn each other's esteem - instruments in hand - in endless performances. Obviously, one cannot be inspired all the time. And we all know that working too hard is detrimental to creativity. One wonders whether with a different management Cream would have lasted any longer. The Bruce/Baker relationship had always been a difficult one. Clapton ("the master of the cliché", according to Rolling Stone - the magazine was also critical of Jack Bruce's bass style) felt he didn't like being forced to play long solos all the time. Clapton's (and Baker's) next group, Blind Faith, found Clapton as a very reluctant "God", ready to jump ship. While Bruce embarked on dangerous trips with The Tony Williams Lifetime ("when Blind Faith played Madison Square Garden we had an engagement at Slug's"), and with Carla Bley on the album Escalator Over The Hill, then proceeding to record a brilliant series of solo albums of songs. Heard today, the blues tracks featured in the movie - the classic Crossroads, Sitting On Top Of The World, Spoonful, I'm So Glad, and the "home-made" classic Politician - don't sound tired, or played in auto-pilot. One can see Baker's verve, Bruce jumpin', Clapton's mouth twitching due to the tension. A blues band: this, according to legend, is what Atlantic boss Ahmet Ertegun thought he had signed, with Clapton as the leader, guitarist and singer. But Clapton didn't like to sing, and didn't write much; so they had to feature the songs that Bruce was writing, among them the group's perennial classics Sunshine Of Your Love and White Room; mostly penned by Bruce the tracks that make Disraeli Gears and (above all) Wheels Of Fire's studio LP such interesting works beyond their (excellent) blues style. Directed by Tony Palmer using what was available at the time (more than adequate means, but not if you want to look impressing on MTV) Cream Farewell Concert was a legendary movie, later on VHS and DVD-V. Dunno what a young person watching it for the first time will make of it, though. If one recalls that Cream were in those days one of the biggest bands in the world, it's funny how "minor-scale" everything is - rock still being "minority music", not the invisible wallpaper that's nowadays such a large part of everybody's life. One could also consider the age of those involved at the end of the career of a group that had already changed rock music, Bruce being 25, Clapton 23, old Baker 29. Quite shocking to see that, when interviewed for the movie, the group members talk about music and instrumental technicalities (think about the topics that would be chosen if this movie were to be shot today). It's quite likely that the importance of physical dexterity for the music played by one of the big groups from the days of what has been perceptively called Jurassic Rock will be missed by most newcomers. Will they bother to watch it again?